Image retrieved from moodle.kidsb.org on February 10th, 2014. Hemp (cannabis sativa), was one of the first crops to be planted by the early American colonists. Their knowledge and use of the plant, however, started much earlier. The ships on which they sailed from Europe were rigged with hemp rope and hemp or flax sailcloth. Many wore hempen britches and other coarse clothing from hemp fabric. And in all probability their land grants, sailing orders, and maps were inscribed on hemp/flax paper made from discarded cordage and rags. The word paper comes from the Latin papyrus, but modern paper as our ancestors knew it was a substance totally different from both papyrus and woodpulp. It was a "mixture of flax and hemp, or a composition made from one of these substances..." This was true for the first 1750 years of papermaking. A little over 100 years ago a new synthetic paper was developed from chemically treated woodpulp. 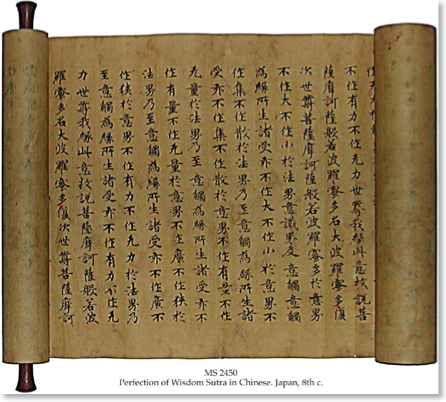 According to a generally accepted tradition, the first paper was made by the Chinese in the first century A.D. the inventor was Ts'ai Lun, from the province of Hunan, north of Canton. The oldest documents written on paper and found by archeologists and in the British Museum. They are Buddhist text from the 2nd and 3rd Centuries A.D. These and other manuscript rolls, some with Sanskrit characters, have been analyzed by Dr. Wiener of Vienna. "His study showed that they were a mixture of bark, and old rags, principally hemp." As would be expected, the Chinese printed the first mass produced book. It was called the dharani, or book of prayers, printed in 770 A.D. from copper plates. Several thousand of these books were printed and some intact copies are on exhibit at the Paper Museum. Dard Hunter, who has researched and written about paper most of his life, examined this book to determine the kind of material used. Hunter: "The paper that I examined is composed one-hundred per cent of hemp (cannabis sativa) and is of the 'laid' type." He found the paper "of a light tan colour, as would naturally be the case with unbleached hemp as the material." After keeping the art to themselves for 500 years, Chinese papermaking spread to Japan and Korea in the east, and to Persia and Arabia in the west. It reached Korea in 600 A.D. and Baghdad in 793 A.D. Four hundred years went by before Europeans picked up paper making from the Arabs. The first Western paper-mill was built in Spain in 1150 A.D. by the Moors, the second was built in Italy in 1276. The art of papermaking finally reached England in 1494. Some scholars attribute the illiteracy and "flat world science" of Western Europe to the late development of papermaking and book printing. No doubt this is true. During the Dark and Middle Ages, when Europeans were still speaking in riddles and trying to decipher unreadable parchment, the Arabs were translating the works of Euclid, Ptolemy, Aristotle, Plato, and Hippocrates. The Greek classics did not find their way into Europe until the fall of Constantinople in 1453. Europe, in those days, was suffering under the twin burden of racial bigotry and Christian paranoia. "The fanaticism that drove the Christian world to reject and destroy everything that smacked of the Muslim civilization" caused them to reject the Arabic paper as well. The only good Muslim was a dead Muslim in the eyes of the Christian Crusaders of that era. The cultural and religious antagonism between Christian Europe and Islamic Asia probably accounts for the late introduction of both paper making and hemp smoking. Hashish too was a nasty Arab habit. By the 16th century hemp had become such an integral part of European culture some were wondering how they could possibly function without it. Francois Rabelais (1490-1553) devoted eight pages to the mighty hemp plant in his classic THE HISTORIES OF GARGANTUA AND PANTAGRUEL: "Without it, how could water be drawn from the well? What would scribes, copyists, secretaries, and writers do without it? Would not official documents and rent-rolls disappear? Would not the noble art of printing perish?" Although we usually don't think about it, paper and the hemp and flax industries played as crucial a role in the rise of the Industrial Revolution and the founding of the American colonies as did coal, steel and wool. William Thompson, in his provocative book, AT THE EDGE OF HISTORY, points out that "industry runs on paper as much as on coal, and if English mercantile society had no means of producing and controlling the vast amounts of information commerce generates, the Industrial Revolution would never have happened."